A startup called Clear Labs has genetically tested a bunch of hot dogs, and the results are about as weird as you’d expect. Pork DNA in the turkey dogs. Chicken DNA in the veggie dogs. But then, there was this little surprise: human DNA! Human DNA in hot dogs! And from the way the press is spinning it, you’d think Oscar Mayer was being run by Hannibal Lecter. Clear Labs, whose headline-grabbing hot dog study kicked off a crowdfunded consumer initiative called Clear Food, has a simple goal: Using genomic technology to find out what’s really in our food. As a proof-of-concept, the team analyzed 354 hot dogs and sausages from 75 different brands. Troublingly, they found that some of our favorite brands contain more than they advertise. Around 3% of hot dogs and sausages analyzed contained pork where it wasn’t listed, ten percent of vegetarian dogs included animal DNA, and — most shocking of all — 2% of samples contained person DNA. Naturally, this last revelation has precipitated a flurry of alarming headlines. Is it finally time for anti-cannibalism America to renounce its beloved but oh-so-questionable meat-flavored food product? Maybe, but not because of this human DNA business, as Clear Labs itself is the first to acknowledge. “The human DNA contamination we found was quite minor,” Clear Lab founder and CEO Sasan Amini told Gizmodo over the phone. “It’s a very complicated supply chain, and this could be from human skin, hair, or fingernails.” But, Amini maintains, in no case was human DNA a significant ingredient. Oh really? Clear Labs was founded by Amini and Mahni Ghorashi in 2013, both of whom left their jobs at established genomics companies to start applying DNA testing to the food industry. They’ve spent the last few years refining methodologies and developing a database of genetic information on a wide range of food items. Now, they’re showing the world how revealing — and, if taken out of context, alarming— molecular analyses can be. Using state-of-the-art metagenomics methods — tools that allow researchers to genetically profile the different types of organisms in a sample — Clear Labs says it’s able to take any food item, and determine exactly what plants, microbes, animals, and fungi it’s made of. The results of Clear Labs’ in-house DNA sequencing analyses are matched to the company’s ever-expanding database of genetic information; any food items that don’t match are cross-checked against additional public databases. It’s a semi-quantitative science, meaning Clear Labs can’t tell you exactly how much pork is in your chicken dog, but it can tell you if there’s a lot or a little. And according to the latest report, there’s very little human DNA in about 2% of the samples Clear Labs analyzed. Wait, what? Cornell University food scientist Martin Weidmann has another explanation. “This is most likely a result of issues with analyzing large data sets, which can easily lead to erroneous results,” Weidmann told Gizmodo in an email. In an article published in Food Safety Magazine, Weidmann warns would-be food testers about the pitfalls of interpreting metagenomic results, including the high potential for false positives. 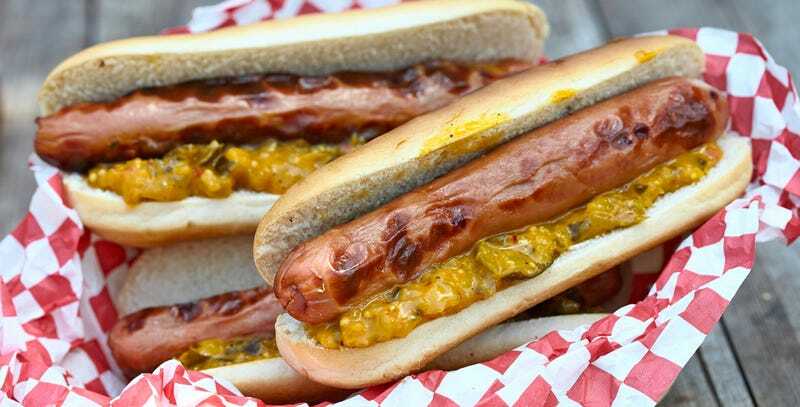 What’s more worrisome from Clear Labs’ report is the significant amount of off-label ingredients found in several hot dog brands. The occasional use of chicken or pork in a vegetarian dog is especially troubling. Some people aren’t just choosing to eat veggie dogs — they’re allergic to meat and will get very sick or die if they consume it. These unwanted ingredients, Amini says, were “all over the spectrum” in terms of their genetic contribution. Couple Clear Labs’ report with recent revelations of rainbow trout in so-called salmon and horse meat in purported beef, and it starts to become clear that independent food oversight might be a really good thing, and we should be doing more it. Or was that bit lost in translation? I hope so too. Now can we all please cool our jets on the Sweeney Todd fantasy?